One of the most fun things about chemistry is that for every laundry list of examples, there is always a counterexample. The counterexample does not really violate any general principles, but it enriches our understanding of the principle by demonstrating its richness and complexity. And it keeps chemists busy. One such key principle is the hydrophobic effect, an effect with an astounding range of applicability, from the origin of life to cake baking to drug design. Textbook definitions will tell you that the signature of the "classical" hydrophobic effect is a negative heat capacity change resulting from the union of two unfavorably solvated molecular entities. The nonpolar surface area of the solute is usually proportional to the change in heat capacity. The textbooks will also tell you that the hydrophobic effect is favorable principally because of entropy; the displacement of "unhappy" water molecules that are otherwise uncomfortably bound up in solvating a solute contributes to a net favorable change in free energy. Remember, free energy is composed of both enthalpy and entropy (∆G = ∆H - T∆S) and it's the latter term that's thought to lead to hydrophobic heaven. But not always. Here's a nice example of a protein-ligand interaction where the improvements in free energy across a series of similar molecules comes not from entropy but from improved enthalpy with the entropy actually being unfavorable. A group from the University of Texas tested the binding of a series of tripeptides against the Grb2 protein SH2 domain. The exact details of the protein are not important; what's important is that the molecules only differed in the size of the cycloalkane ring in the central residue of the peptide- going from a cyclopropane to a cyclohexane. They found that the free energy of binding improves as you go from a 3-membered to a 5-membered ring but not for the reason you expect, namely a greater hydrophobic effect and entropic gain from the larger and more lipophilic rings. Instead, when they experimentally break down the free energy into enthalpy and entropy using isothermal titration calorimetry (ITC), they find that all the gain in free energy is from enthalpy. 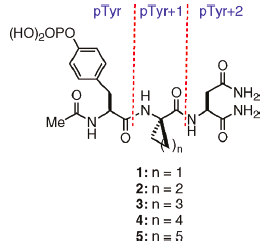 They find that every extra methylene group contributes about 0.7 kcal/mol to the interaction. In fact the entropy becomes unfavorable, not favorable as you move up the series. There's another surprise waiting in the crystal structures of the complexes. There are a couple of ordered water molecules stuck in some of the complexes. Ordered water molecules are fixed in one place and are "unhappy", so you would expect these complexes to display unfavorable free energy. Again, you would be surprised. It's the ones without ordered water molecules that have worse free energy. The nail in the coffin of conventional hydrophobic thinking is driven by the observation that the free energy does not even correlate with decreased heat capacity, something that's supposed to be a hallmark of the "classical" hydrophobic effect. Nonetheless, this study provides a nice counterexample to the conventional thermodynamic signature of the hydrophobic effect. The textbooks probably don't need to be rewritten anytime soon, but chemists will continue to be frustrated, busy and amused as they keep trying to tame these unruly creatures, the annoying wrinkles in the data, into an organized whole. Really? You felt the need to say compensation? Interesting read about a little discussed topic on chemistry blogs. It offers stimulating ideas for further study. Worth sharing among chemists. "The textbooks will also tell you that the hydrophobic effect is favorable principally because of entropy"
When you displace a water molecule in a protein pocket, and move it to bulk water, it will usually be a net entropic loss, but enthalpic win. It seems that this effect is often larger than the old textbook explanation. It depends on whether the water molecule is bonded to hydrogen bonding groups in the protein. If it's not then it's going to be both an entropic and enthalpic gain. If it is then the enthalpy will stay pretty much the same (the hydrogen bonds will be swapped), but the greater freedom will still contribute to favorable entropy. "If it's not then it's going to be both an entropic and enthalpic gain. " You mean an entropic loss and enthalpic gain? Water in bulk is really quite ordered.